A trademark of Learn OmniFocus is that we take a deep dive into topics related to OmniFocus and productivity. In doing so we support people in building robust systems and ingrained habits while making optimum use of OmniFocus. 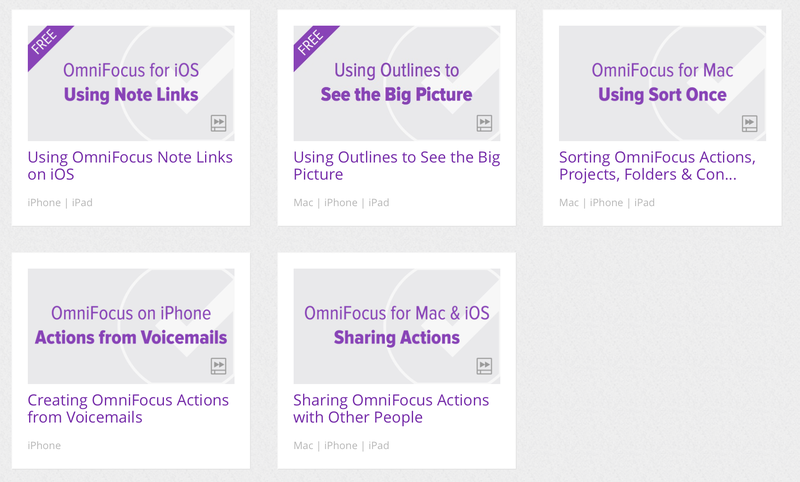 To accent our longer content, we have a growing library of OmniFocus Quick Tip videos. These are short videos (typically less than three minutes) that cover a specific feature, workflow or best practice. Since they’re so short, they’ll likely be easy to fit into your schedule. We currently have five Quick Tip videos in our library (including two FREE ones), and more are in the works. Let us know if there’s a specific topic that you’d like us to cover. 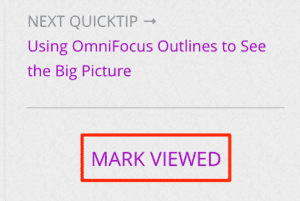 If you’re logged into your Learn OmniFocus account, you can keep track of which Quick Tip videos you’ve watched. Click the MARK VIEWED button under the video once you’re done watching. Thumbnails of viewed videos are grayed out, making it easy to distinguish which ones you’ve watched from those that are still unviewed. This feature can also be used to keep track of longer videos, recordings of live sessions and articles. Conveniently, content that you’ve marked viewed is stored in your account and syncs across all of your devices.